If your Buick is running hot (need to install aftermarket gages such as Autometer so you know exactly what temp your car runs), anything over 210 with no AC on indicates you have a problem. It is possible with the AC on and sitting in traffic to hit 210. There are several problem areas that should be looked into to discover if they are they problem or a combination of them that are causing high temps. 1. 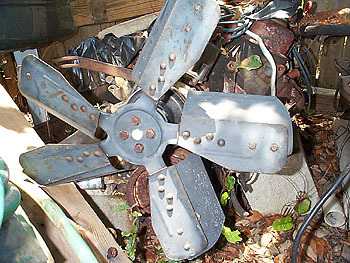 Improper fan, see pics below for proper fan. 2. 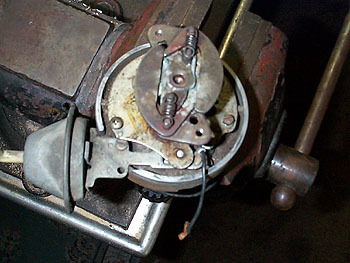 Fan should have a thermostatic clutch, see pic below. 4. Timing is retarded. DO NOT trust timing marks on harmonic balancer to set timing. Use a vacuum gage to set timing. Advance timing to maximum allowed without having ping or hard, hot starting problems. This usually means about 16-18 inches of vacuum. 5. Make sure distributor is not worn, advance weights are moving freely (increase timing at higher rpm), vacuum advance is working properly. 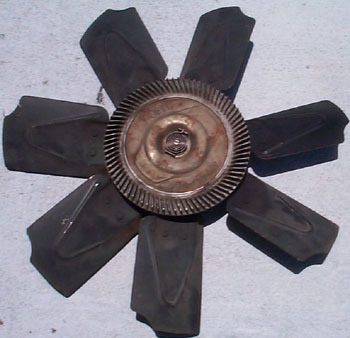 This is a 5 blade fan with standard clutch. This is NOT the one to have on your car. This is usually found on non-AC cars. This is a 5 blade flex fan and is NOT the one to use. 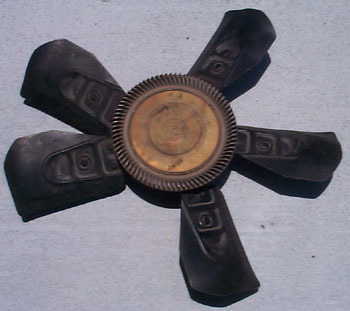 These are notorious for coming apart because after many cycles the fan blades come apart. This is the correct fan to use. It has 7 blades and a thermostatic clutch. Here is a close-up of the thermostatic spring on the clutch. When the unit is hot it engages the fan so the fan spins all the time. These do go bad. To check for proper operation. After car reaches operating temperature, shut engine off. Try to spin fan by hand and it should not make more than a revolution. Quality thermostatic clutches run about $40-45new. Torqflo 922797 from Autozone for $44 is a great unit to use for all applications. Non-thermostatic version are about $20. If your fan does not sit inside the shroud you need a longer t-stat clutch. Use Torqflo 215103 from Auto Zone. 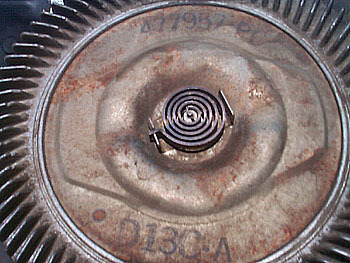 You may have to enlarge the fan holes to bolt the fan to the clutch. Old Torqflo #922722. Also replaces Hayde 2722 and Four Seasons 36977. Make sure the springs and weighs are in good shape for the centrifugal advance. The two small springs seen here can go bad causing too much advance and ping at higher advance. You may want to retard initial timing to solve this problem but that is the wrong solution. Install new springs. Also, check to see the vacuum advance(seen above in lower left corner) is working properly. Use a vacuum source to see if diaphragm is good. If not, replace the unit with a new one. Notice no points in this distributor. This is the item to use to replace stock points and maintain the stock look of the distributor. You can also install MSD, Mallory or HEI instead of points. 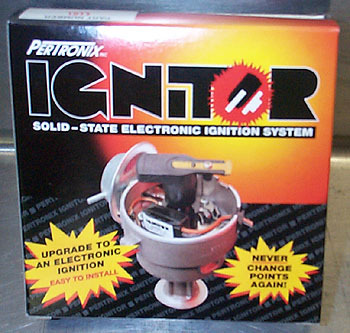 The Ignitor is available from Northern Auto Warehouse for $60. Their contact info is located on the vendors page on this site.